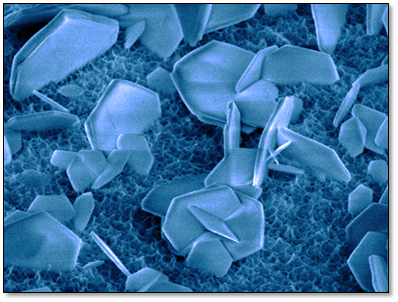 Zinc oxide nanoparticles snap together when properly aligned and form larger crystals. The forces between the particles along a specific attachment direction were measured by atomic force microscopy (shown here) and computed by molecular dynamics simulations. Image courtesy of Kevin Rosso, Pacific Northwest National Laboratory Enlarge Image. Large minerals form from tiny particles continually attaching together. Particles snap to the surface, like LEGO® bricks. And a bit of torque is needed to align the particles. As the particles attach, water is expelled from between the surfaces. Led by Dr. Kevin Rosso, researchers at Pacific Northwest National Laboratory measured and calculated the forces that provide the torque for alignment. They found that in mineral formation, water has a more significant role than previously thought. Water organizes on particle surfaces and transmits structural data to incoming particles. Why It Matters: Understanding particle attachment enables more accurate predictions of when minerals will form and when they won't. These insights provide new ways of studying and controlling material synthesis at the atomic scale. Further, this work offers valuable information for geoscientists exploring subsurface processes. These processes can include mineral extraction and carbon storage. Further, understanding water and particle behavior is vital for those creating materials for new energy storage devices. Summary: Knowing how minerals form is vital for storing carbon underground, creating tailored catalysts, and more. Minerals can form via particle attachment, which involves amassing particles repeatedly until large crystals emerge. During each step, a nano-sized particle snaps to the surface. As the particles attach, they expel water between their surfaces. The forces involved in this process had not been definitively determined. The team measured and calculated the forces that provide the torque for alignment, working at the near atomic scale. They did so by conducting experiments that used spectroscopy and microscopy resources, including atomic force microscopy with designer tips, at the Environmental Molecular Sciences Laboratory, a national scientific user facility sponsored by DOE's Office of Science, Biological and Environmental Research. In a zinc oxide system, they found that water organizes on the particle surfaces. The water transmits structural data about the underlying surface to incoming particles. Thus, water acts as both a solvent for the particles and a messenger about its properties. If incoming particles are strongly misaligned, water acts as a barrier to incorrect attachment, limiting the growth of defective crystals. Understanding how water behaves in mineral formation offers benefits in materials synthesis, geosciences, and catalyst design. Sponsors: This material is based upon work supported by the Department of Energy (DOE), Office of Science, Basic Energy Sciences, Chemical Sciences, Geosciences, and Biosciences Division through its Geosciences Program at Pacific Northwest National Laboratory (PNNL). The Materials Synthesis and Simulation Across Scales Initiative, a Laboratory Directed Research and Development effort at PNNL, supported development of tip fabrication methods and the large-scale molecular dynamics methods. User Facility: Tip fabrication and characterization were performed using the Environmental Molecular Sciences Laboratory (EMSL), a national scientific user facility at PNNL sponsored by the DOE Office of Science's Office of Biological and Environmental Research.